Eyelash extensions are a holy grail for women who love makeup. They are very chic, practical, and beautiful while being available in many different types, shapes and materials. 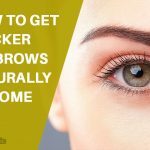 They are also hassle-free and are the perfect solution if you want to look beautiful early in the morning but in the shortest time possible and with minimal effort. However, they are a bit expensive, but they are worth the investment if you crave a fabulous and long-lasting outcome. Interested in getting them done? Then keep on reading! Doesn’t really matter if you are a subtle and natural type of a girl, or if you prefer drama and volume, extensions will suit you either way! Make sure you stick to the kind that suits you the best and also be ready to fall in love with this trend. Here are the top 15 things that you should know before getting a new lash pair. Semi-permanent lashes are applied by a professional and certified beauty esthetician. These lashes can last anywhere from 3-5 weeks and are highly recommended for women who have sparse, short, and damaged lashes. They are a lot different than strip lashes (which can be applied with glue and a pair of tweezers on your own), while lash extensions are applied individually on all of your lashes by a professional. The whole process can take up to 2 hours, which means that you need to be patient and still. The esthetician will work with sterile and proper equipment while you lay down during the procedure. Many women love bringing their headphones with them so that they can enjoy the process, listen to some music, and relax at the same time. Once you make yourself comfortable make sure that you keep your eyes closed and shut. Don’t peek since you don’t want any glue dripping in your eye. After your lash procedure is done you will have to avoid heat, water, and makeup. Your lashes should be protected since they are still drying down. The glue shouldn’t come in contact with any of these factors since it might cause your lashes to fall out sooner than expected. Make sure you keep your extensions safe during the first 12-24 hours after the appliance. After that, you can go reckless and apply your makeup, wash your face, or even swim in the ocean! Extensions will save you time in the morning as well as during the day. Imagine not applying your mascara, false lashes, or even using an eyelash curler on an everyday basis? It is possible. With eyelash extensions, you will have a fabulous outcome, and you will look like a goddess every morning you wake up. Also, using mascaras on top of your falsies is not recommended since they can tug and pull out your extensions. This means that you won’t need to purchase a new mascara for quite some time. You can still go heavy on bottom lashes and apply your favorite mascara. Something that not that many estheticians will tell you is that you will also get an ”eyeliner” look with the right pair of lashes. This is because the base of your lashes is thick and full, which will make the illusion of an eyeliner. You can just wing out your liner at the end, and up with a cat eye in the shortest time possible. Know that matte liners are highly recommended since they dry a lot faster than the liquid ones, and that you should avoid liquidy products. Although you are saving time and money with your lash products, you are not really saving money at the salon. For instance, lash extensions usually cost anywhere from $40-100 (based on the type you are going for, your place of living, and the salon itself). You will have to do a refill every 3-5 weeks if you want to keep them looking new and fresh. However, many salons charge half the price once you come back for a refill. Just keep in mind that the longer you go in between the refills, the more lashes you will need to stack in, and the more it will cost you. Rubbing your eyes isn’t the best option since you can loosen the glue and lose your lashes. 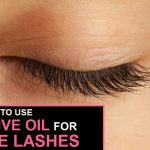 Try not to tug your lashes and your eyes, and make sure that you avoid using oil-based products. Also, oil makeup wipes and cotton pads will dissolve the glue. When it comes to removing your makeup, you should use lukewarm water and oil-free pads. This process does take a bit more time in the evening, but it is a must if you want to have a long-lasting outcome. Also, maintenance wise, use a disposable mascara and a clean one each and every time you wash your face. You can also use a brow ”spoolie” just so that you comb through your lashes before going to bed. Make sure you let them air dry so they dry back to their natural shape. If your salon fulfils these requirements, then you are at a right place and you should proceed further with your process. However, if not, be cautious. Unsanitary places, uncertified estheticians, and lower pricer tags are often good indicators that your chosen salon might not be the best option. Make sure you end up with someone who is experienced since poorly equipped and uncertified people might leave you with unwanted reactions such as redness, irritation, swollen eyelids etc. Shedding process is a process that happens to everyone (both men and women), and you shouldn’t be freaked out by it. Just like your hair falls out, so do your lashes. This means that your natural lashes fall out along with your extensions every 2-4 weeks. Once your lashes start to shed you will notice a weird gap in between your extensions. This doesn’t mean that the glue is too weak or that you have done something wrong to your new pair, it is simply a natural process. Just make sure you get them refilled once the difference becomes too obvious. 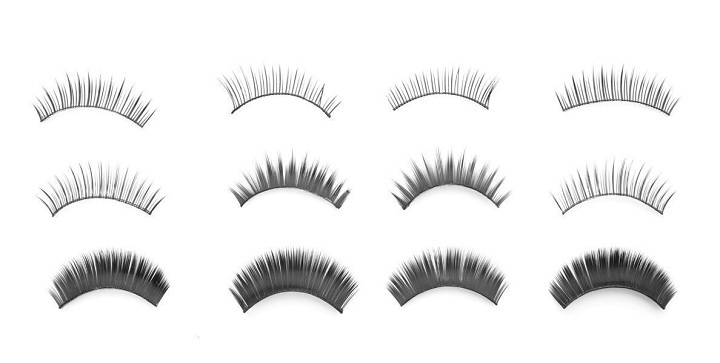 Synthetic lashes are made out of sturdy materials. They can appear shiny to some, and are quite dramatic looking. Synthetic lashes are mostly used by women who love spicing it up and going for drama. However, they do a pretty decent job when it comes to holding of the lash. If you are someone who prefers a good hold, this is your way to go. Synthetic lashes can also curl easily, and they are very long lasting. The biggest downside to them is that they are not the softest lashes and they are mostly recommended for women who have dense lashes. If you have a thicker lash, you should get a few of these just to fill up some of your gaps. Silk lashes are a lot more flexible than synthetics and are also very soft once applied on the lids. If you prefer lightweight lashes you are going to love these. They are also very sturdy and long-lasting. The curl is not as plasticky as it is with the synthetic; therefore these can look a lot more natural on every woman. If you are someone who prefers a natural and fluffy outcome, this is your way to go. Also, this lash is mostly a top choice for brides and those who love a natural fluffy look. Even if you are someone who prefers some volume and length you can just ask for more lashes and a bigger curl and you will love your outcome. Faux mink lashes are cruelty-free, which means that they are made out of the best fibres which can mimic the real mink. Mink lashes look a lot like real fur which means that they are soft, easy to bend, and fluffy. You can even swim with them and wet them without being worried about losing definition and your wanted curl. They are well made and they will remain wispy. 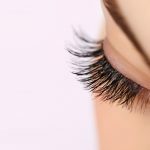 Some women might find them to be a little less long lasting than once compared to silk or synthetic lashes, but with proper care, you can have these on for weeks. 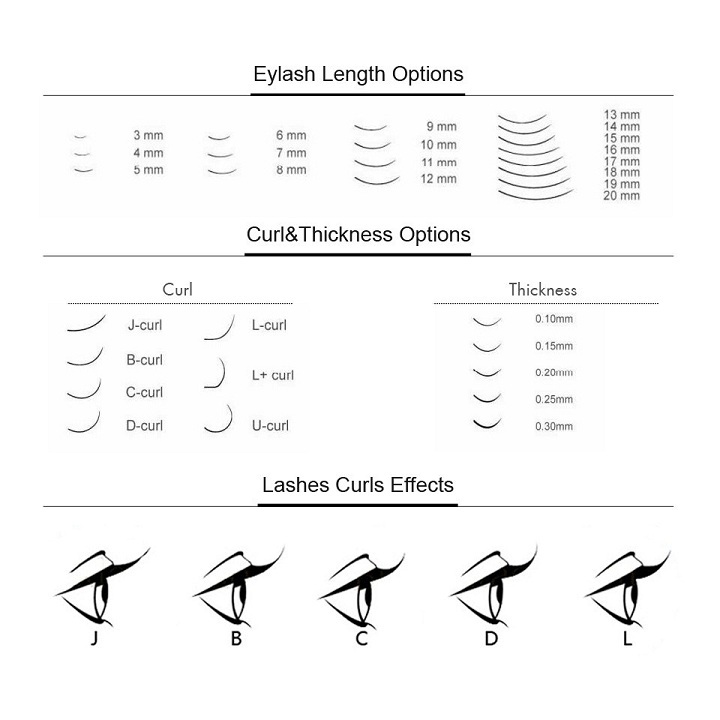 The most common curls for lash extensions are J, B, C or D curls. Based on your eye type and shape you have to know what you want to have. Not every curl looks good on everyone. For instance, if you have small lids and flat lashes you can’t really go for a subtle lash (J) since it won’t look noticeable at all. Make sure you talk it through with someone who is professional before proceeding further. The shortest option that you can go for is the 6mm to 8mm lash extensions. Medium lashes range from 9mm to 12mm. Women who want drama and length can go for 13mm lashes or 14mm. Women who love extreme lengths will enjoy anything from 15mm and above. Usually, lash estheticians stick to 9 – 12 mm lashes since these are most natural and asked for. Be aware that the more volume you choose, that the more time you will spend at the salon, and more it will cost you. Some lashes are thicker than the others, there are: 0.07mm, 0.10mm, 0.12mm, 0.15mm, 0.18mm, 0.20mm, 0.23mm, 0.25mm and 0.30mm. Once applying them, your lash lady will (usually) either stick to 0.12 mm, or the 0.15 mm lashes. Anything above this is quite heavy and unnatural looking on the lid. However, you should never remove them on your own. 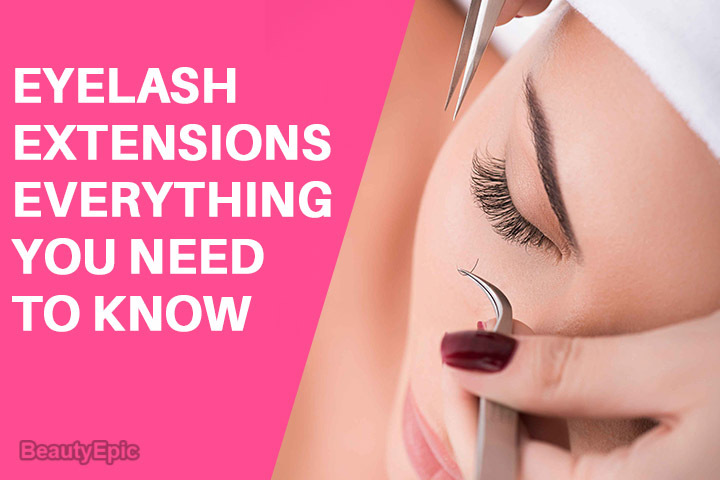 You might tug your natural lashes along with these and hurt yourself, so make sure that you stick to a professional solution.